Agnete Hoy was born in Southall, England on 3rd November, 1914. Her Danish parents, Soren and Anna Blichfeldt had been living in England since 1906. Soren, an eminent research bacteriologist from Copenhagen, had been invited to set-up a new scientific laboratory for the Maypole Margarine Works in Southall. This factory was owned by a progressive Dane, Otto Monsted, who ran his works on model socialist lines - a way almost unknown in England at that time. Being born into a reasonably well-off, middle-class family, Agnete enjoyed an idyllic childhood. In common with other families of the same social standing she and her two elder brothers, Svend and Eric, were looked after by a nanny and the household also supported a cook and maid. She had a very good visual memory of the large Edwardian mansion in which they lived and talked many times of the sweeping circular carriage drive and the large, magical garden. It was here that she learnt to love all natural things, always preferring to play outside with her brothers, rather than with her dolls. This happy childhood was to end abruptly with the tragic early death of her beloved father in 1921, when Agnete was only 7 years old. This had a profound effect on her for the whole of her life. The family’s income was now drastically reduced and her mother decided to take the young family back to Denmark, where she knew the boys would receive an excellent free state education. Agnete aged 13 years The family boasted strong artistic traditions both in the visual arts and music and she was encouraged to take up her interest in painting on pre-formed ceramics. Thus at age 19, she applied to the Copenhagen College of Art and Crafts and was accepted, studying there for 3 years. After this she worked with Gerhard Nielsen at the Holbaek Pottery for a year and then moved on to working at Saxbo for Natalie Krebs. 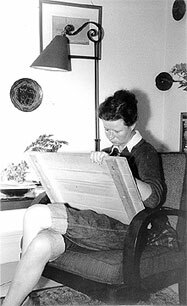 In 1938, Agnete married Askel Hoy, an architect, 7 years her senior and it was this surname she would use for the rest of her professional career. Within a few months the marriage failed. Agnete applied for a formal separation and left Denmark, accompanied by her mother in 1939 to get away from the unhappy circumstances. 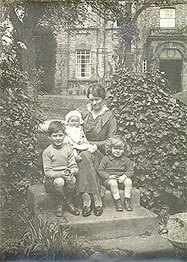 She planned to visit her two brothers who had returned to England to work, a few years earlier. It was during this visit that war broke out and they were unable to return to Denmark. Needing work, Agnete went to stay with her brother Svend, who lived in the centre of the pottery manufacturing industry at Stoke on Trent and secured work with Bullers Ltd. Later on she became head of their studio and continued in this position until they closed it down in 1952. After this, she moved down to London to be with her second husband, Harry Bohrer, whom she married in 1943. Once in London, Agnete applied directly to the Doulton Lambeth studio and was appointed head of the studio until its closure in 1956. The next year, Agnete set-up her own studio in her home at Acton, West London and in the early 60s began lecturing and teaching at various art colleges, including Hammersmith, Farnham and Richmond. Her husband Harry died in 1986 and she carried on her life as best she could without his support. However from the early 1990’s onwards Agnete suffered from a disabling illness which was born with great dignity. She died at West Middlesex Hospital, Isleworth on 1st April, 2000.